Zosterophylls with peculiar branching mode ? Two less-common plants in the Rhynie chert, Trichopherophyton and Ventarura, have been assigned to the zosterophylls, a group of plants whose fossil evidence seems to be restricted to the Devonian. The zosterophylls are of phylogenetic interest as they are believed to be ancestral to the lycophytes including the recent clubmosses. 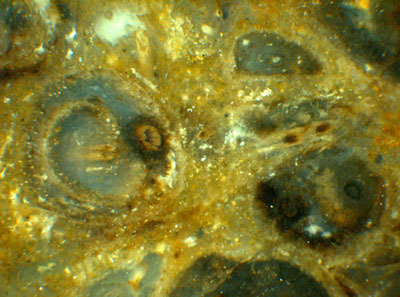 Trichopherophyton is not really rare in the chert but apparently had often been overlooked because the upper part of the plant with its characteristic spinous hairs is found much less often than the hairless lower parts which probably were subterraneous or submerged and thus had a better chance of silicification. 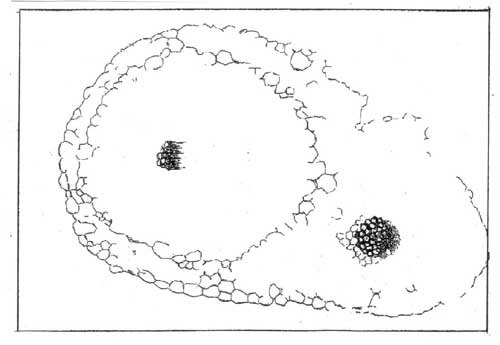 The strange phenomenon of one Trichopherophyton axis or shoot inside another one (Fig.1) had been observed before and interpreted as incidental intrusion [1,3]. A quite different interpretation is proposed here. 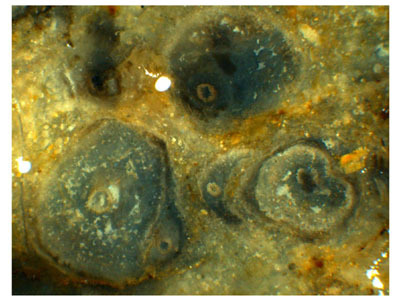 Fig.1: Trichopherophyton cross-sections: new shoots forming inside older ones as seen on the raw surface of the chert sample. Width of the picture 7.7mm. Closely spaced Trichopherophyton cross sections can be found in large numbers even on faces of small chert samples, which implies that they are sections of upright axes since creeping axes most probably would have random directions in a plane. It is surprising that sections of the one-in-another type are seen rather often. Also it appears that the allegedly invaded axis is not always in a state of decay, and there are rare cases of well preserved samples apparently showing coherence of the tissue across the boundary of the inner axis (Figs.2,3). These observations suggest a much more interesting interpretation than incidental intrusion or other sophisticated explanations based on unlikely asumptions as in : After forking of the central strand, the two prongs proceed inside the common shoot for a while and move apart until eventually one of them stakes off a circular claim by surrounding itself with a distinct borderline within the common tissue. Fig.2 (right): Trichopherophyton cross-section of composite type, no indication of squeezed tissue. Width of the picture 1.9mm. Fig.3: Same as Fig.2. The apparent coherence of tissue across the inner boundary seems to rule out the interpretation favoured in [1,2] as one axis intruding into another one. As seen in Figs.2,3, this partitioning of the cross-section goes without squeezing. Apparently the inner axis is suordinate at first, as suggested by the smaller diameter of its central strand (Figs.1,2), but further on it seems to take the lead while the outer part becomes narrower and eventually wilts (Fig.4). The process may repeat itself so that finally one or more shoots look like being wrapped into old sheaths. Fig.4: Same as Fig.1, advanced stages of new shoots forming inside older ones, with the inner shoot dominating (below left) and the outer part being reduced to a sheath which finally may split so that a crescent-shaped residue of the old shoot is left (below centre) which has become detached from the new shoot. Width of the picture 6.5mm. There is at least one benefit of such growth mode: Old plant parts covering the base of fresh shoots is a means of multiple protection well known from flowering plants, as onions, for example. It would be interesting to know whether this peculiar way of growing protective sheaths as suggested by the aspect of Trichopherophyton cross-sections is unique and restricted to the zosterophylls or found in other plants, too. 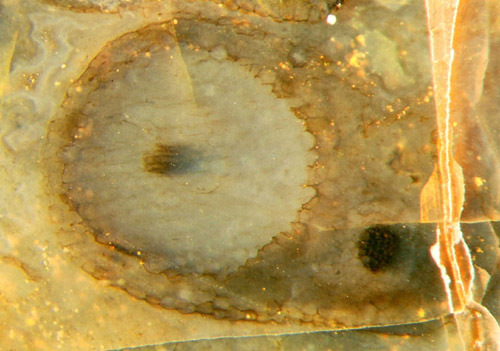 Since there seem to be good reasons for one axis growing inside another one, it is not surprising that this phenomenon has also been found with the other zosterophyll in the chert, Ventarura. A few cases from Windyfield chert, which is a separate variety of Rhynie chert, are mentioned in , and one is shown there and interpreted as a rhizome growing along a decaying fragment, despite of its vertical orientation. Own finds suggest that the lower part of Ventarura often branches in the same peculiar way as Trichopherophyton does so that there is no need to invoke improbable incidences for an explanation. It has to be mentioned that the above tentative interpretations are based on sections seen on the sample surface and on arbitrarily chosen cut planes. Serial sections could possibly provide more insight and lead to better substantiated conclusions. D. Edwards : Embryophytic sporophytes in the Rhynie and Windyfield cherts. Trans. Roy. Soc. Edinburgh, Earth Sci. 94(2004 for 2003), 397-410.